In this guide I’m going to explain the different types of web hosting for new businesses. What’s The Difference Between A Domain Name & Web Hosting? A domain name is your online identity – think of it as being like your piece of internet real estate. When you register a domain name that’s what you’re getting – a name. If you want to build a website or set up email addresses using your domain name then you’ll need a web hosting service. Web Hosting is the collective name for all of the technical and support infrastructure that allow you to have a website and email addresses. So when you register a domain name it won’t ‘work’ as such until you set up the web hosting for your domain name. When you buy a web hosting service what happens is that your hosting company will setup a web hosting account on a server. A server is a powerful computer which can host hundreds of websites. The server is permanently connected to the internet so that your website is always available and your email works constantly. The server is housed in a specially built frame with other servers called a ‘rack’. The rack likewise is stored in a specially built facility called a ‘Datacentre’. 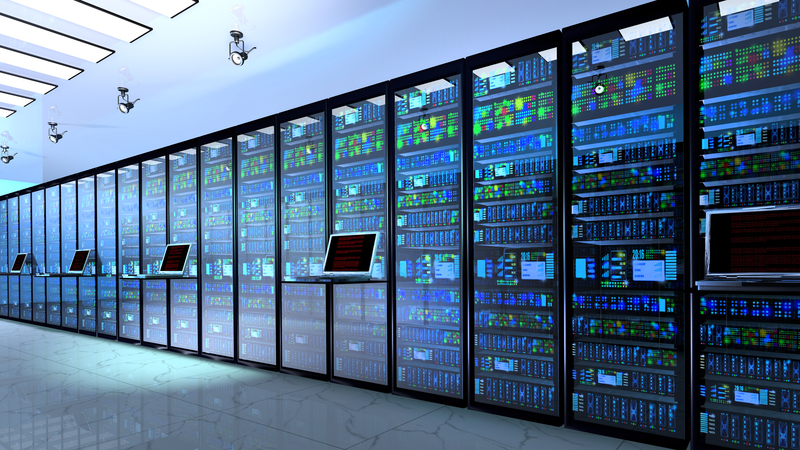 A Datacentre is a multi-million pound facility which has extremely high levels of physical, power and network security to ensure that the servers are fully functioning as close to 100% of the time as possible. The Datacentre provides multiple levels of network and power connectivity as well as being highly secure. It is built with security in mind from the ground up with back up services for power as well as state of the art fire prevention systems. When someone searches for your website on the internet, the internet does a check to identify where your website is hosted. It does this by checking the ‘IP address’ of your domain name. The IP address is a series of numbers (and also characters for version 6 IP addresses) which give the internet the exact address of the server that your website is hosted on. The reason we use domain names is because humans are not very good at remembering numbers. So the internet will detect the server in the datacentre and ask for the website data to be provided by the server. Likewise when you send emails or are sent emails the internet checks the IP address of the domain so that it knows where to send the emails. All of these activities are completely invisible to you and I and happen extremely quickly – usually less than a second. When we talk about shared hosting all we mean is that your website will be hosted on a server with other web hosting clients. Therefore the physical resources of the server are shared amongst all clients on that server. Shared hosting has the advantage that it is low cost and is not complex to use. You do not need to learn how to manage a server of anything complex like that. Your hosting company will manage the server and keep it secure and updated. In order to ensure that the server functions correctly the hosting company will usually create a specific software configuration that can not be changed by end users. Therefore if you want to use more exotic tools or software you may need to check first if these can be run on shared hosting. For most small businesses shared hosting is usually the sensible choice. Reseller Hosting is slightly different from shared hosting because it is intended for people or businesses who wish to offer hosting services to their clients without incurring the costs or complexities of setting up their own server. Reseller hosting is ideal for web designers, web developers or other web professionals who have clients who need value added services like web hosting. This way they can earn an ongoing recurring revenue stream from their clients. As with shared hosting, resellers are hosted on servers with other resellers and likewise have a standard software configuration. However, Resellers can have control over the features (diskspace, email accounts, databases, etc.) of the hosting service that they offer their clients so that they can offer different plans with appropriate pricing depending on the features the client needs. A VPS is where a server is split into logical or virtual machine so that several ‘virtual’ servers can be hosted on one physical machine, each with it’s own distinct Operating System (OS). Each VPS has access to the server’s main components such as CPU, memory and disk space. A VPS can be used to either host more demanding applications for one client or they can be used by web designers, web developers or agencies to sell hosting services on to their clients. The main advantages of a VPS are power, flexibility and scalability. Because the VPS has allocated resources such as CPU and RAM they are extremely fast and powerful. With a VPS you can then sell the services on to your own customers if you wish as with Reseller Hosting or you can reserve it for just one website or application for extra security and power. Unlike shared and reseller hosting there are no configuration issues so you can setup your VPS exactly how you need it. You can choose from a range of Linux systems for your VPS too. VPS are also extremely scalable. With a VPS you can increase the CPU or RAM to the level you need without the need for physical changes or downtime as would be the case with a Dedicated Server (see below). However, power and flexibility comes at a price and a VPS does require a certain level of technical knowledge to administer it. With a Dedicated Server this is a physical server reserved entirely for one customer. There is no sharing with other customers. The server is entirely for your use only and that includes all of the key components such as CPU, RAM and disk space. As with a VPS you can then choose to sell the hosting on to other clients or use it completely for your own website or applications. With Dedicated Servers the advantage is that you have access to a very powerful machine so any applications or websites that you host will run really fast because nobody else can access the CPU, RAM or hard drives. As with a VPS you have 100% control over the configuration for the Operating System and software and security settings. The only thing you need to consider is that with a VPS you can start small and only pay for the resources that you need which makes it very costs effective, whereas with a Dedicated Server you start with a set of fixed resources (CPU, RAM, Disk Space). That means you may pay more initially for resources that may not initially be fully utilised. In order to help you make the right decision for your hosting needs, let’s explore the main features of each type of hosting. A web hosting control panel like cPanel enables the user to manage all aspects of their web hosting service. Think of this as being the dashboard for your hosting. One of the most important things you’ll need to do is set up email addresses. This is done through your hosting control panel and you can set your emails up to download to your favourite email application like GMail or Outlook and you can access your email from any internet connected device such as a mobile phone, Tablet, Laptop or PC. If you want to run certain applications like a blog or an online shop you will need to have databases to store all of the data such as products or blog posts, etc.. The most common type of database is MySQL which we offer. Website Builder is a simple, intuitive tool for building websites which is for non technical or novice users who want to build and maintain their own websites. It is template based so you just choose the template you like and you can then customize it by adding your own logo, text and images. Addon Domains are a great way to save money because you can host more than one website with your hosting account. The way that Addon domains work is that if you have more than one domain name you can just set up another hosting account for the second one in your hosting control panel. For example if your main domain was business1.com and business2.com is your second domain name then you can create a new hosting account and a new website for business2.com. Domain Parking is a useful feature if you have more than one domain name and you want to point the other domains to your main website. For example if you main domain name is your .co.uk and you decide to buy the .com then you can set the .com as an Parked Domain and it will redirect to the .co.uk website. That way if someone types in the .com domain by mistake they will still end up at the correct (.co.uk) website. Having a backup of your website files is really important and you can do this via your web hosting control panel. FTP stands for File Transfer Protocol and this is the way that you can publish files (i.e. your website) to your web hosting account. If you want to run an application like a Blog or an Ecommerce store on your website then you’ll probably want to use a ready made application like WordPress or Magento. There are literally hundreds of these types of applications to choose from and many of them are free because they are created as OpenSource software. To make life easier for you these are all available as one click installations so that they can be installed really quickly and easily through your hosting control panel. You manage your Reseller hosting via an administration area called Web Host Manager or WHM for short. This is your control centre where you manage all aspects of your clients’ hosting accounts. WHM is part of the same suite of products as cPanel so it all works together seemlessly so that when you create an account in WHM you are creating a new cPanel account for your client. Overselling is the ability to create plans where the total amount of disk space or bandwidth that you offer all of your clients exceeds the total amount of these resources in your Reseller Plan. By way of an example, if you are on the Wizz Entry Reseller Plan you are allocated a total of 50GB of hosting space. If you started to create 5GB plans for your clients and Overselling was not allowed then you would be limited to ten 5GB plans because 10 x 5GB = 50GB. However, as Overselling is allowed you can create as many 5GB plans as you like and as long as the total amount of data used by your clients does not exceed 50GB then you are fine. As a Reseller you will want to position yourself as the host rather than Wizz Hosting. With our Reseller Plans we offer full white label capabilities so that there is no mention of Wizz Hosting in the cPanel Hosting Control Panel. You can also use your own custom (vanity) nameservers which you use to direct your client’s domain name to their hosting account on your Reseller Plan. With WHM you have the ability to create your own plans so that you can allocate different levels of service for your clients to maximise your investment. You can control parameters like disk space, bandwidth, addon domains, parked domains, email accounts, databases and much more. This way you can offer a full range of services with a clear upgrade plan for your clients. In order to ensure you have full control over your clients you have the ability to temporarily suspend or permanently terminate accounts. This would normally be for things such as non payment of hosting fees or for any abuse related issues such as spamming or hosting malware. No doubt your clients will want to add extra functionality to their websites or use a particular application like WordPress or Magento. With our Reseller Plans you can offer these with the one click installation feature which enables your clients to quickly and easiy install these. With a VPS they can be ‘spun up’ in a couple of minutes so there’s no waiting around. Likewise if you need to upgrade or add more CPU, RAM or diskspace you can do this instantly with no waiting. With a VPS you can choose the Operating System (OS) you want to use from a list and it will be provisioned for you when you order so no need to wait for lengthy manual configuration. With a VPS you can choose which type of hard drive you require such as 10K SAS or super fast Solid State (SSD) Drives. With a VPS you are in full control over the configuration of the server so you can use the software that you want and the security settings that you want. With a VPS you are hosted on a cloud based infrastructure. This means that your data is stored across several physical servers which offer redundancy. This means that there is no single point of failure and your data is safe even in the unlikely event that one server fails completely. VPS come with a full backup service so you can keep your data safe and manage your backups. With a Dedicated Server you have full control over the hardware configuration so you can choose the amount of CPU or RAM that you require as well as the configuration and type of hard drive that you use, e.g. 2 x 7.2K SATA Drives in RAID 1 configuration. With a Dedicated Server you have access to a lot of processing power straight away so you can be sure that your website(s) and application(s) will run extremely fast. Because you are hosted on your own server you are 100% isolated from any other users so there is a very level of physical security. Which Web Hosting Is Right For You? The type of hosting that you choose depends on your current and future situation. Here are a few examples to ensure you make the right choice. If you’re running a small business or you’re a new business then Shared Hosting is the perfect option for you. You get a generous amount of disk space and plenty of email addresses and you can send and receive emails via any internet connected device such as a mobile phone or tablet as well as a Desktop or Laptop. If you want to build a website then you have the option to use our Website Builder tool which is really easy to use. If you have a web designer building your site or you are a more advanced user then Shared Hosting also includes free one click installation tools like WordPress (blogging tool) and Magento (Ecommerce tool) or hundreds of other applications. If you are building websites on behalf of others then you could choose from either a Reseller Plan, a VPS or a Dedicated Server. If you have a small number of clients and you don’t want to be responsible for server administration and your hosting needs are not custom or more complex then a Reseller Hosting Plan is a good choice for you. It is low cost, fully featured, fast and reliable as well as being white labelled so there is no mention of Wizz Hosting. If you have more complex requirements in terms of the software you want to run or other custom configurations such as security then a VPS is a good choice for you. It is more complex but we also offer a full management service so we’ll take care of things like security and software updates. A VPS is also more expensive than a Reseller Plan but you get significantly more power and flexibility with a VPS as well as the ability to upgrade as much as you like instantly. If you are determined to offer the absolute highest performance to your clients then an SSD VPS will do this for you. Finally, if you are running applications or hosting sites for clients who need the peace of mind that their data is completely isolated from other users then a Dedicated Server is the appropriate solution for you. As you can see there are many factors that need to be taken into account when choosing the right hosting plan for you. For Shared Hosting you’re on a shared server with other clients and you have a wide range of standardised services to choose from. With Reseller Hosting you have a bulk amount of diskspace you can resell to your clients and generate an ongoing, recurring revenue for these services. With a VPS you get more power and the flexibility to run the software you want and you can get up and running and upgrade very quickly. With a Dedicated Server this offers high power and security but is a more expensive option initially. Wizz Hosting are always happy to help and we hope this has been of use but if you have any questions just click on the Live Help button on our site for instant help 24 x 7.